On December 1, the Edmonton Coalition Against War and Racism (ECAWAR) celebrated a decade of peace activism in the city. The organization got together in December of 2002 when a number of people who were already involved in anti-war activities in Edmonton decided to join forces to plan protests about the war in Iraq - particularly urging the Canadian government not to get involved. 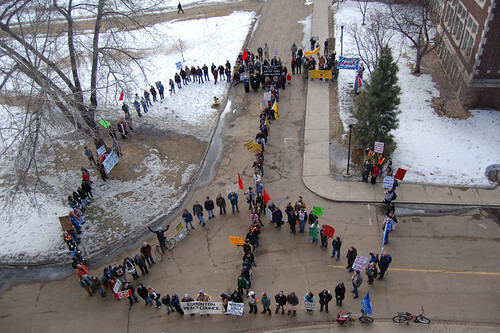 As a result, the two largest peace protests in Edmonton's history took place in February and March of 2003, with tens of thousands of people taking to the streets. Ten years later, ECAWAR is still marching for peace, organizing rallies, hosting teach-ins, and teaming up with other organizations for emergency actions. Our anniversary event was filled with memories, reflections, and plans for the future. I became involved with ECAWAR in September of 2005 when I showed up at a peace rally with a camera and started taking pictures. A slideshow of my photos ran continually projected on a large screen. It took me an entire afternoon to cull the collection down to around 200 photos. A couple of years after I became involved with ECAWAR, I began writing and performing political protest songs. I played a set of three of my best-known songs at the anniversary - it was great to play them inside on a stage; a real change from usually performing them outside in all weather! One of my favourite parts of the event was when people were invited to share their memories of ECAWAR. The event was already running over and I felt I spent enough time on the stage, so I decided against getting up there and sharing a memory or two. My first one is, of course, my first peace rally. I showed up with my camera and then asked one of the organizers if I could take pictures. I was happy that Peggy Morton said yes. We have since worked together to organize many peace events that I have captured on film. Perhaps my favourite memory is from the peace march on March 17, 2007. Before we headed down Whyte Avenue from Corbett Hall, we decided to join in a movement taking place around that time of forming a human peace sign. Andrew Fraser, another avid photographer and ECAWAR member who now lives in Toronto, and I were the assigned photographers. In order to get the photo, we had to climb up seven flights of stairs to the top of the parkade. Then, we had to lean over the concrete wall and angle our cameras down to ensure the entire peace symbol got into the picture. I was totally winded from running up seven flights of stairs, and in addition, I am terrified of heights. So, needless to say, this was not an easy task. Plus, we had to try to steer everyone from up there, without megaphones. After the mission was accomplished, we raced down the stairs to join the march, which had started without us. I had asked Peggy to please not have everyone start marching until we were down, but I guess you can't stop a couple hundred enthusiastic peaceniks. So, winded again from running down the stairs, I had to take my position alongside the group and start running to keep up, as I often have to do when I am photographing and filming. "How do you feel?" I was asked shortly after I descended, by someone who knows just how queasy heights make me. "I'm only slightly nauseous!" I yelled, loud enough for everyone around me to hear - and share in a laugh. Okay, so maybe you had to be there. But take a look at the photo at the top of this post. The ends certainly justified the scary means. I am totally looking forward to more peace activities with ECAWAR in the coming future.